I'm sick. I got myself a cold that turned into a sinus infection. So I am making myself feel better by thinking about beautiful things. I'll be better very soon. But I thought I would just come here and show you some photos of the autumn colors on our mountain. It took a little extra time for the colors to be really cool up here. That is because our mountain has a lot of tulip popplers. These trees are really cool during every other season, but they aren't the best when it comes to the fall. The leaves tend to just go brown and fall off without any sort of blaze of glory. But now that the tulip poppler leaves are gone we can see some of the other colors. A view of the tiny house with the leaves. A field of purple in our meadow. 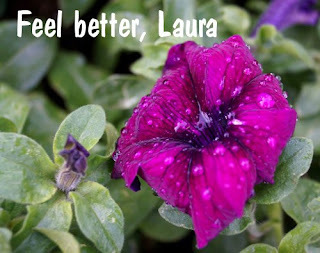 And finally; my friend, neighbor, and fellow blogger Cyndi made me this virtual get well card. Check out her blog at Pictimilitude! So you know how I found this post? I had done an "analysis" of my blog optimization, and this particular post came up as one of the incoming links on my blog. Go figure. You enter your website and it tells you where you can improve and shows incoming links and all that good stuff. So, thank you so much! !